Nichit Ray is a carpenter earning Rs. 150 a day. Occasionally, he would earn Rs. 200-300 a day for some polish work. Those few days, Ray family could afford the luxury of machar jhol ( fish curry) with rice and potatoes. The family of five did not have much but were content with their life in the small village of Madinapur, West Bengal. Today Nichit’s father, Vaben, 45 year old needs a valve replacement. You will find father and son walking across the hallways of Apollo Hospital, Bangalore trying to make sense of those numerous reports and scans. One look at his Nichit’s eyes, you know this 27 year old is so pained and scared to see his father on a hospital bed plugged to wires. “They told me Baba needs surgery. Doctor Sir has assured he can cure him. But he is my father, how can I not worry?”, Nichit’s eyes well up as he looks at the plastic bag full of reports and scans. Vaben complained of frequent breathing difficulties, weakness and fever. The government hospital wrote him off with reasons like fatigue, dehydration. But one day, he collapsed in the market while picking up groceries. 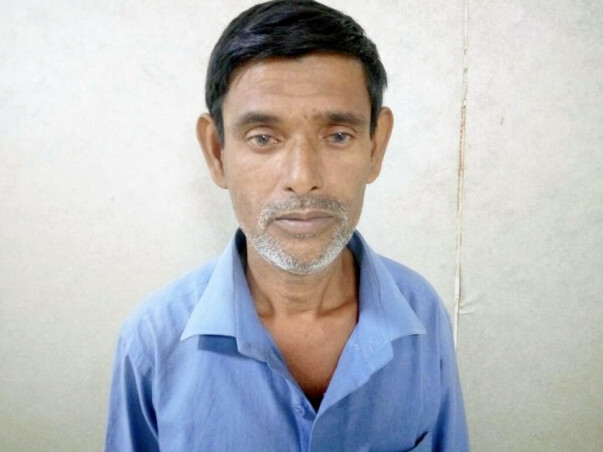 He complained of severe chest pain but with Nichit away for work in Raichur, Karnataka, they skipped Doctor’s consult. A year later, tests confirmed that Vaben needs a valve replacement. It was a moment of relief for Vaben and his family to know his father’s ailment had a fix. But the thought of a surgery petrified him, and so did its cost. The cost of the surgery is 3 lakhs. The family of 5 survives on Nichit’s daily wages. They have already loaned 60,000 from a money lender in Raichur. Also, they have mortgaged a small piece of land back in Madinapur, West Bengal. The piling interest of that amount worries Nichit and his father. Though they have arranged for 1.50 lakhs, the family is helpless and sees no way to arrange for the rest of funds for the surgery. Nichit and Vaben need our support. With your help, Vaben can undergo the surgery as planned. This surgery will give a son his healthy father back. Please contribute now and help Vaben. We have great news on Vaben’s health condition. During his regular check-ups, Vaben was reevaluated prior to his surgery. It was found that his valve leakage has become mild and the doctors realised that he can be cured with medicines. Vaben came for surgery to Apollo Hospital but he did not require the surgery anymore since his health condition was found better. 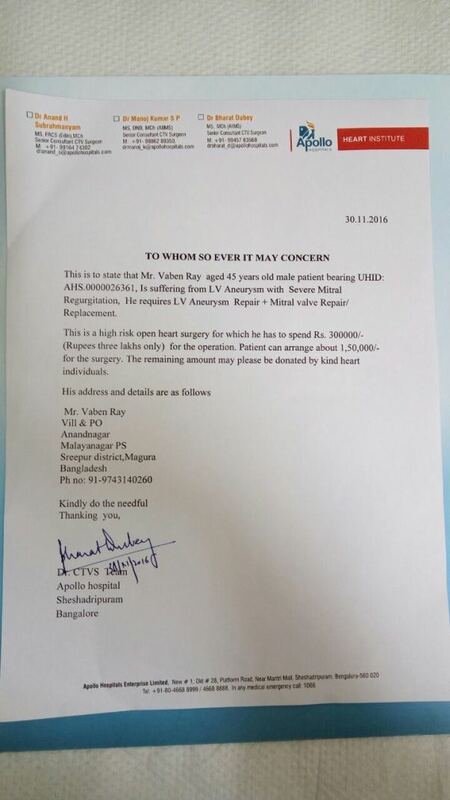 We are trying to raise funds for Danish, 7-year old kid, who is in need of Intra-Cardiac Repair. We have managed to raise Rs. 42,954 and will need 1,80,000 to perform his surgery. Funds raised for Vaben Ray could help this kid undergo a life-saving surgery. Thank you so much for coming forward to help Vaben. Vaben's condition has improved over a while. 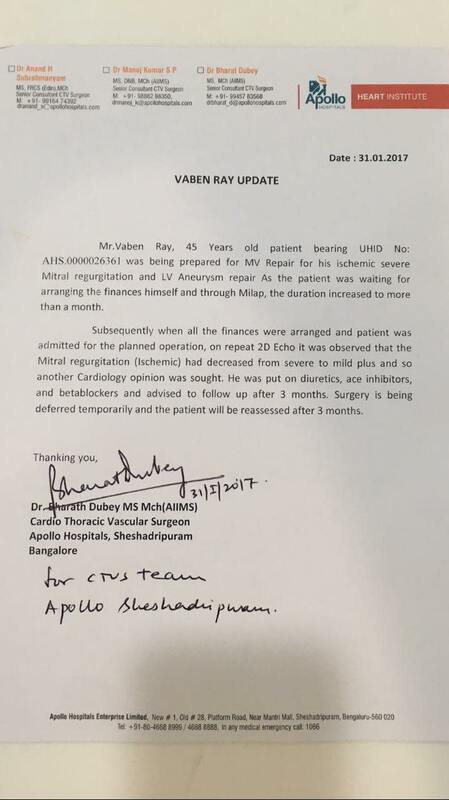 Vaben ray was admitted to Apollo for abnormalities in the heart. During tests it was found that his condition- has improved steadily hence the treatment has been temporarily deterred. He has been asked to come for regular check-ups once in every three months and will be reassessed after that. I am saddened to see this. Our donation contribution hopefully will help restore Vaben's health and bring peace to his family.